Malay, Chinese, Indian and European influences all come together in the heady culture of Malaysia. Enjoy its pristine beaches, explore the dense rainforests, and savor some of the best food in the world. An invitation to paradise! Journey into the wild where nature is your playground and adventure is around every corner at Club Med Cherating Beach resort. Make adventure the centre of your next family getaway at Club Med Cherating Beach. Discover a beachfront jungle landscape where treetop adventures, turtle viewing excursions, rock climbing, watersports, and private moments on Pantaï beach set the tone for an unforgettable encounter with nature. Sip a refreshment at the Zen pool where 360-degree sea views and raw beaches are unforgettable, or invite your children to dive into our action-packed clubs and fun-filled activities. Here, amidst the tropical flora and fauna of Malaysia, magical moments are found in our Green Globe-certified playground for adventurers. Get set for a wild vacation in the heart of our seaside jungle retreat. Set amidst tropical flora and fauna, Club Med Cherating Beach is where calming waves lap and where the peace found in nature is captured through extensive green initiatives. Be immersed in untouched nature and learn to give back in the spirit of conservation. Here, nature is your playground and adventure is around every corner. To truly be immersed in this destination, take part in these five distinct experiences to enjoy during your stay. Push your climbing skills into the wild at our family-friendly Cherating Beach resort with 2 activities that are perfect for children and parents to share, each expertly by our skilled G.Os. On the Pantaï side of the resort, explore the tropical jungle from a bird’s eye view by climbing challenging rocky cliffs on the beach. At the centre of the resort, challenge yourself to one of our treetop courses for any experience level, zipline through the trees, and feel what is like to see the jungle from above. Perfect for beginners and advanced G.Ms, this course is guided by trained G.Os who will outfit you with the right equipment and always put safety first. There’s no better way to experience the raw beauty of nature. During your stay in Club Med Cherating Beach, reconnect with family on an educational and fun eco trek game led by our Green G.O. Head out into the dense jungle where birds chirp in the trees, and all matter of life is all around you just waiting to be discovered. Our Green G.O will guide you and your family on a journey of discovery together to uncover the extensive wildlife and lush nature in this treasured locale. 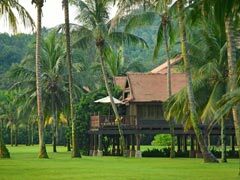 Spend time reconnecting with family on our 2 peerless Malaysia beaches where fun-filled water sports guided by G.Os are within reach, or savour an unforgettable meal at the Rembulan restaurant overlooking the sea and beautiful gardens. Escape for relaxing indulgence in our spaces reserved for adults: Enjoy a dip in the Zen swimming pool, refreshments from The Zen Bar, or pamper yourself with an wellness-focused poolside spa treatment for ultimate relaxation. *Additional costs may apply. During your visit with our certified Green G.O, you’ll be able to experience 3 unique and immersive activities. Located just beside Asia’s first Club Med in Cherating, Malaysia, the Cherating Turtle Sanctuary offers you a rare experience with these beautiful creatures. 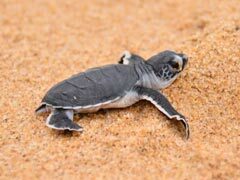 The centre was established in 1972 as a turtle hatchery in an effort to protect the endangered species. First, take a guided tour of the nearby sanctuary with our Green G.O. You’ll learn all about the important works it is pursuing and the vital role it plays in conservation while viewing 2 different species of turtle—the ubiquitous Green Turtle and rare Hawksbill Turtle. You’ll also see freshwater terrapins, enabling you to learn the differences between terrapins and turtles. The sanctuary—which nurtures hatchling as they grow into juveniles as well as rescues and cares for adult turtles—also houses other aquatic models and information panels such as dugong, terrapins, and corals reefs. Here, you’ll be educated on the major threats to turtles such as pollution and fishing activities in order to raise more awareness. Second, you’ll also be able to take an excursion out of the resort to observe egg laying. You’ll also be able to witness turtle hatchlings, which will be kept here until they are old enough to be released into the sea during the night. Finally, you can also take part in the turtle release while watching them make the daring trek to their new ocean home. It’s one of the many ways Club Med Cherating Beach is committed to sharing its green initiatives with you. Turtle release is usually available from May to October. The turtle experience is conducted daily except Mondays and Saturdays or Malaysian Public Holidays. *Additional costs may apply. Take a guided journey to the mangroves where you can discover and learn about fireflies in their natural habitat. This unique and educational riverboat experience is perfect for families seeking new adventures with nature. Begin by learning all about these magical creatures: how to recognize males and females, where they live, and how to protect them. When the sun sets, get set for an exhilarating mangrove night trip where you’ll uncover a fairy tale scene of glowing fireflies all around. Watch as they light up the trees like Christmas in full view—it’s like nothing you’ve seen before. Included: Drinks served by the glass and at the bar only: water, fruit juices and sodas, hot drinks and cocktails with and without alcohol, wines and local and international spirits. A selection of sweet and savoury snacks. In line with Malaysian law, Club Med is only allowed to serve alcoholic drinks to our guests above 21 years old. Meet up at The Orchid Bar all day long for a refreshing beverage amidst chic surroundings. 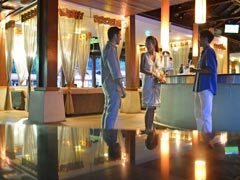 Located centrally next to the Mutiara restaurant, pool, and excursions desk, the bar offers a welcoming atmosphere to dream up your next adventure, sample a freshly mixed cocktail, or dance into the night. Step up to the bamboo-wrapped Bayou Bar, located next to the water sports on the Pantaï side of the resort. With the sand beneath you, cool off with a tropical refreshment with friends and family. 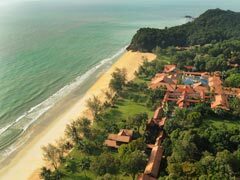 From warm, sunny afternoons to stunning sunsets, let Cherating beach be the setting of a restful break in paradise. 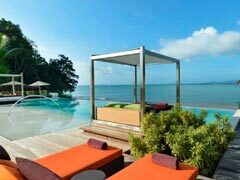 Spend restful days by the pool at our ultimate resort reprieve, The Zen Bar at the Pantaï side of the resort. Reserved for adults and featuring a bar and swimming pool, you’ll discover our resort within a resort experience. 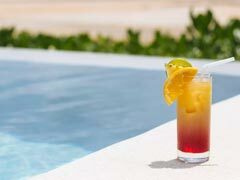 Settle into a comfy poolside lounge bed and enjoy simple refreshments from the bar delivered right to you. Take in panoramic views of the sparkling sea and the raw beauty of nature, and reconnect in paradise. Dine and delight. From seaside views to fresh, all-day dining on the terrace or indoors where it is air conditioned, Club Med Cherating Beach offers a variety of dining options to pique any palate. Savour a selection of healthful options, locally-authentic fare, or international delights in any of our restaurants while connecting with nature all around. In line with Malaysian law, Club Med is allowed to serve alcoholic drinks to our guests above 21 years old. Indulge in a relaxing lunch on a terrace or indoors with verdant jungle as a natural backdrop. At this centrally-located venue, coloured lighting sets the ambiance of a Cherating paradise where a selection of traditional Asian and international delights is prepared at the buffet corners. At each of these corners, sample from cuisines including Malay, Chinese, Japanese, Indian, Korean, Italian, and cuisine with a French touch. For added convenience, a Baby Corner will offer a place to prepare special meals, and a variety of amenities to make dining with a young one relaxing. Please note: Tables seat 2 to 8 people. High chairs and booster cushions are available upon request. Enjoy the raw beauty of nature and stunning vistas of the sea and the beach on the Pantaï side of the resort. 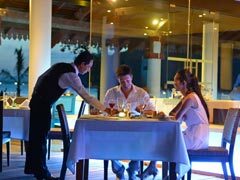 Rembulan’s relaxed atmosphere welcomes you to dine indoors or out on the breezy terrace from late lunch to an à la carte dinner. 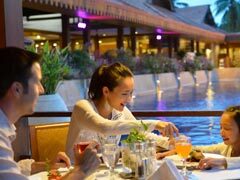 Savour delicious Asian dishes, a beach or pool barbecue, and healthful options as part of the all-inclusive Cherating experience, or treat yourself to a private dinner or a romantic lobster dinner. Additional costs may apply. Please note: Tables seat 2 to 8 people. Reservations are required for dinner. Settle into the modern comforts of The Noodle Bar, where bright, vibrant spaces set a casual and welcoming scene for savouring a delicious meal together. Watch as our Chefs cook right in front of you from live cooking stations. 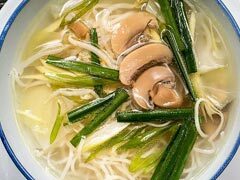 Try one of our hand-made Asian-style noodle dishes with a variety of flavours and presentations, as well as the freshest ingredients to entice any palate. 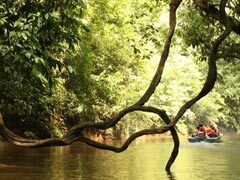 Spend family holidays in Cherating surrounded by nature. 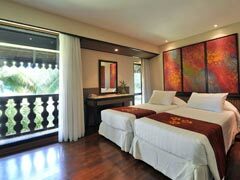 Our rooms and suites are set in a tropical landscape, havens for restful nights after action-packed days. Take in garden views from any of our Club Rooms. Choose from a Club Room with a sofa bed for small families, or treat yourself to one of our seaside Club Rooms, which include a sea side view through wide windows. Rollaway beds or baby cots can be added in some room categories, while a flat screen TV and WiFi access offer moments of relaxation indoors after days of activities out in nature. 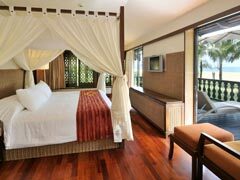 Check into one of our Seaside Suites for a stay in our jungle escape. Enjoy restful nights on the four-poster king size bed wrapped in white linens. A living room offers a sofa bed for restful breaks, and enjoys access to the private terrace. Get ready for the day at the double vanity with sea glass sinks, or relax in the deep soaking bathtub or separate shower. Featuring an expansive terrace with lounge seating, and the ability to expand to a connecting Club Room with an even larger terrace, families seeking a space to reconnect will enjoy this home away from home. A flat screen TV and WiFi offer moments of relaxation indoors after days of activities out in nature. As a suite G.M., you can enjoy private transfer to and from the airport, breakfast room service, and evening turndown service. 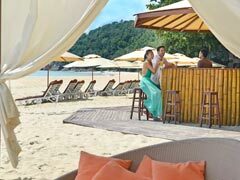 Make adventure the centre of your next family getaway at Club Med Cherating Beach. Discover a beachfront jungle landscape where treetop adventures, turtle viewing excursions, rock climbing, watersports, and private moments on Pantaï beach set the tone for an unforgettable encounter with nature. Sip a refreshment at the Zen pool where 360-degree sea views and raw beaches are unforgettable, or invite your children to dive into our action-packed clubs and fun-filled activities. Here, amidst the tropical flora and fauna of Malaysia, magical moments are found in our Green Globe-certified playground for adventurers. Get ready for fun. With active pursuits for all ages, Club Med Cherating Beach gives children places and spaces to become adventurers. Whatever their interests, our exclusive nature activities and age-specific clubs were created with them in mind so they can enjoy the very best of their family getaway. Age-specific clubs: Baby Club Med® (4 to 23 months) (extra charge), Petit Club Med® (2 to 3 years) (extra charge), Mini Club Med® (4 to 10 years) (included), Club Med Passworld® (11 to 17 years) (included). Hotel amenities and facilities for kids: BABYSITTING From 4 months to 7 years (extra charge), ​CLUB MED BABY WELCOME® (FROM BIRTH TO 23 MONTHS) Until 23 months (Included), PYJAMA CLUB From 4 months to 7 years (extra charge), BABY CORNER From 4 to 23 months (included), BABY FEEDING AND EQUIPMENT ROOM Until 23 months (included), PLAYGROUND. Activities included: Archery School, Flying Trapeze School with circus activities, Fitness School, Sailing School, Treetop adventure School (Accrobranche/ In Summer only), Badminton, Basketball, Beach volleyball, Rock climbing, Football, Squash, Volley ball, Yoga, Aquafitness, Tennis, Adventure walk in the jungle (Jungle Walk), Cardio and weights room, Kayaking.